Valley Metro has reduced the fare on its Island Airport Shuttle from the Brownsville South Padre Island International Airport to just one dollar. This come as good news to the 50,000 passengers expected to ride the shuttle this year. The buses leave frequently from in front of the Airport and take riders directly to Port Isabel where Island passengers change to the Island Wave, which takes them across the Queen Isabel Memorial Bridge to their Island destination. The schedules, which are synchronized so passengers do not have to wait, can be found on the Airport’s web site at: www.flybrownsville.com. “This is great news for our Laguna Madre area flyers” said Brownsville Airport Director Larry Brown. “Of courses we have eight new parking lots, but the value of a $1 shuttle cannot be underestimated. I know it will continue to play an important role in our tremendous growth” Brown added. The Airport, which opened in 1929, had lost all passenger service in the 1990’s and had only one airline with three flights in 2004. It now has three Airlines and numerous flights, including the only non-stop international flights from any of the five area airports. Elderly and disabled shuttle passengers can now ride Valley Metro buses for 50-cents, as do students and veterans. Kids under seven ride for free. Brownsville Metro bus passengers also ride for free with a transfer. Valley Metro’s extended routes between Port Isabel and Laguna Vista are also free. The incredibly popular passenger conveyance began in 2005 and has grown exponentially, making it necessary to buy larger buses four times. 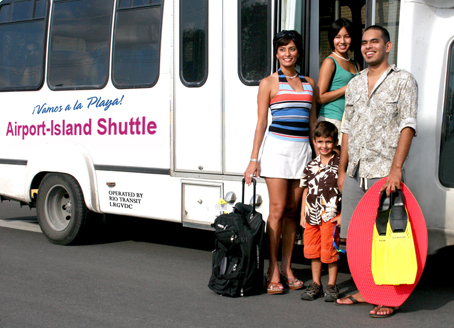 The current 28 passenger bus is the largest airport shuttle in the Valley.